Mecki the Hedgehog is a cartoon character originating in the 19th century, based on the tale of The Hare and the Hedgehog, from the brothers Grimm’s famous fairy tale collection. The fable tells the story of a hedgehog who tricked a competing hare into believing that he was faster than the hare and drove him to deadly exhaustion in a race of 73 rounds. 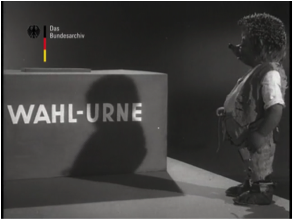 On the edge of World War Two, the fable was made into a film on behalf of the “Reichsstelle für Film und Bild in der Wissenschaft und Unterricht” (Bureau for Scientific and Educational Film in the Third Reich) and produced on 16-mm film by the brothers Diehl. The animated movie The Race of Hare and Hedgehog (1937) with intertitles was used for school teaching and for the entertainment of soldiers. 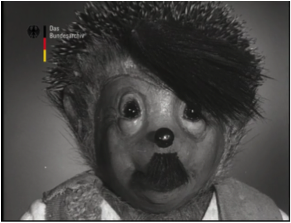 After the war the hedgehog became the mascot of Hör Zu!, one of the most popular program guide magazines that had been in print since 1946. In Hör Zu!, the hedgehog by the name of Mecki was used to provide critical comment on the radio program. Later, editorial staff members Reinhold Escher und Wilhelm Petersen, drew full-page cartoons with the hedgehog’s adventures. In a lawsuit, the publishing rights for comics and books were assigned to Hör Zu!, whereas the rights for the doll-production were assigned to the toy company Steiff. One of the Diehl brothers, Ferdinand, started his own cartoon film production in 1948 and made films on Mecki adventures that were ordered, among others, by Bundeszentrale für Heimatdienst (1963 renamed in Bundeszentrale für Politische Bildung, Bureau for Political Education). The Mecki films were intended to be educational, such as Mecki Fights the Flu (1952) or Mecki, the Just (1954). Moreover, stories of Mecki in newsreel editions of Neue Deutsche Wochenschau (NDW) were used to increase the voter impact in times of German Bundestag elections: Mecki directly encouraged his audience to go to the ballot box and prevent the empowerment of radical groups – particularly those with pro-Nazi attitudes. Mecki made sure to point the viewers to the potential consequences of political abstinence (see figures from NDW No. 187 of August 25, 1953). (4) last but not least, the fable of “The Hare and the Hedgehog” might itself have played an important role in media history: the ‘hedgehog’ of television overtook the ‘hare’ of cinema newsreels, which in the end became replaced by television newscasts and documentaries. Dr. Sigrun Lehnert majored in Media Management. Since 2009, she has been a research assistant in Journalism at Hamburg Media School. She received her PhD in 2012 at the University of Hamburg with her project about newsreels and television news shows in the 1950s, supervised by Prof. Dr. Knut Hickethier. Her book “Wochenschau und Tagesschau in den 1950er Jahren” has been published by UVK Verlagsgesellschaft in October 2013. Seegers, Lu (2001): Hör zu! Eduard Rhein und die Rundfunkprogrammzeitschriften (1931-1965). Potsdam: Verlag für Berlin-Brandenburg, pp. 202-204, 216-218. Seegers, Lu (2001): Die Erfolgsgeschichte von Hör Zu! (1946-1965). http://www.lmz-bw.de/fileadmin/user_upload/Medienbildung_MCO/fileadmin/bibliothek/seegers_hoerzu/seegers_hoerzu.pdf, pp. 41-44 (about propaganda-illustrator Wilhelm Petersen), 66-67, 80, 83-86. Sackmann, Eckart (1986): Mecki: Maskottchen und Mythos: Comicplus: Hamburg.